THIS VEST IS THE ONLY ONE IN THESE FABRICS AND WILL FIT SIZES 10-12 OR A 14 WITH A SMALL BUST. IT IS ADJUSTABLE DUE TO WHERE THE BUTTON AND LOOP CLOSURE IS PLACED. 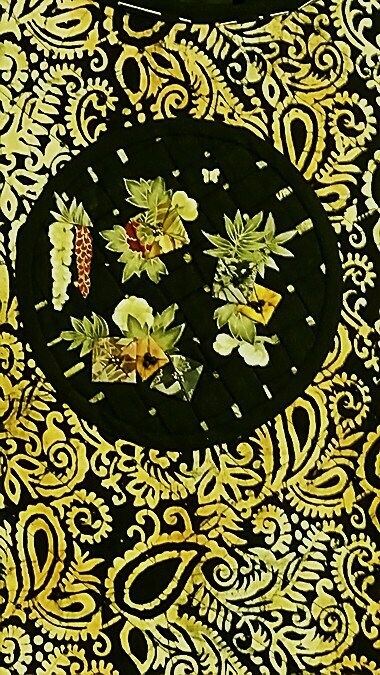 THIS BEAUTIFUL VEST IS MADE FROM GOLD TONE AND BLACK RAYON BATIK FABRIC. THE ONE SIDE IS A PAISLEY PRINT THAT IS DIAMOND QULTED AND FEATURES A 2.5 MM JET JASPER ROUND BEAD AT EACH INTERSECTION OF THE QUILTING. 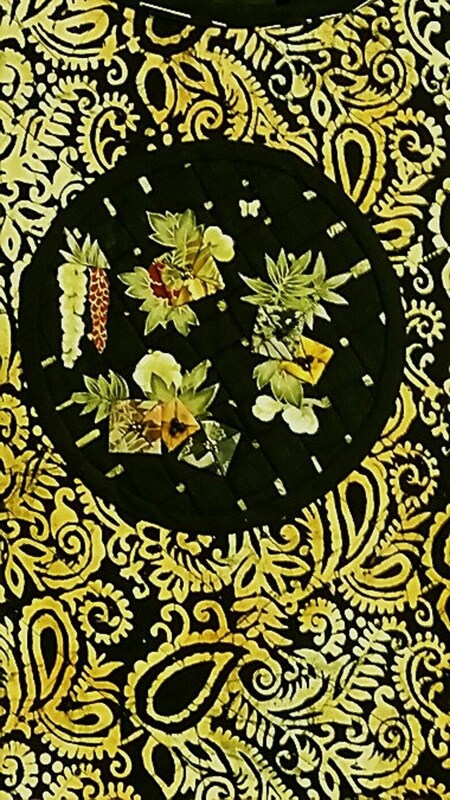 THE CENTER BACK HAS A BLACK RAYON 'BASKET-WEAVE' CIRCLE WITH ORIGAMI STYLE HAND FOLDED FLOWERS AND LEAVES WITH BEADING ON THE FLOWERS. THE FRONT HAS AN ASYMMETRICAL BUTTON AND LOOP CLOSURE AND THE FRONT PANEL IS ROUCHED AND QUILTED WITH 4 MM FACETED BALCK BEADS. THE REVERSE SIDE IS A DIFFERENT RAYON BATIK FABRIC IN EARTH TONES OF KHAKI, GOLD, AND GREEN. THE CENTER BACK HAS A BEAUTIFUL MACHINE EMBROIDERED OUTLINE FLOWER WITH A GREEN BUTTERFLY. THE FRONT HAS A BLACK PANEL INSERT FEATURING A LOVELY QUEEN ANNE LACE FLORAL MACHINE EMBROIDERY WITH TINY GOLD BEADS. THE ENTIRE VEST IS FINISHED WITH HAND STITCHED BLACK RAYON BIAS BINDING.